Sunday’s ride took me to the YMCA to meet O. for friend/weightlifting time and then to Charles Village for a sandwich and then to Remington to see what all the fuss is about, because I hear that’s where all the cool kids are moving these days. I zigged and zagged, stopped to pick up this week’s CSA produce (hard squash are back! ), and followed Sisson to the end, because the ladyfriend promised if I did that I’d get to see a bus graveyard, and she was pretty sure I’d like it. She was right. 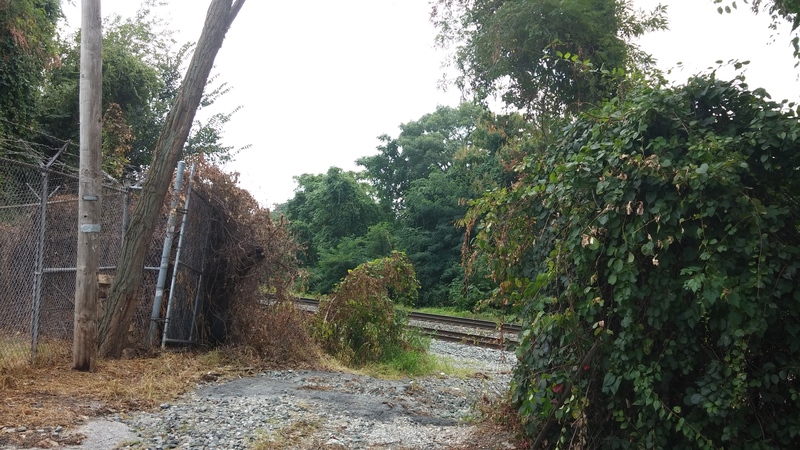 And then I was at the dead end of the dead end, this view of train tracks through a break in the fence and shrubbery, Veolia’s Circulator parking lot to the left, a generation station just over its shoulder. It’s like all the secret stuff that makes life go that I never think about is hiding out in Remington. I finished my ride by zigging and zagging, marveling at how tiny a neighborhood can be, and then headed home the long way, up to 39th, just to see what the Mansion People were doing on a Sunday afternoon before taking the lane on Greenmount, because on a Sunday afternoon, it’s just empty enough for me to be that brazen. This entry was posted in neighborhoods and tagged Baltimore, Greenmount Avenue, One Straw Farm, Remington. Bookmark the permalink.